Since there’s nothing like watching a good movie in a darkened room, remote controls in this price range generally offer full hard button backlighting to make them easier to use under any lighting level. The R50 is no exception and delivers... well, something. Until now Universal Remote has used blue LEDs on their remotes so bright that they’re visible in almost any ambient lighting. 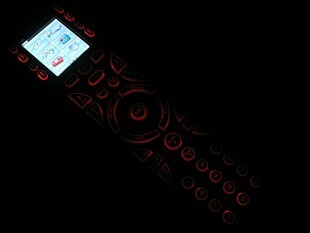 With the R50 I had to turn off every light in the room before I could even tell if there was a backlight to see – the end result being a soft red glow that serves as more of a gentle hint at button placement than a forceful declaration. It’s not that the R50’s dim red LEDs couldn’t have got the job done by themselves, but that the LCD screen is so very bright in comparison. In a completely dark room with an ordinary all-hard-buttoned remote, I might well appreciate that the darkroom-safe backlighting doesn’t cause the entire room to suddenly glare shocking blue when a button is pressed... but in this case the LCD is capable of being so much brighter and in-your-face that it completely drowns out the keys. To match relative output levels the LCD would have to be set to a brightness level of no more than 30%, which is just too dark for standard use. Adding a little salt, the remote warns during setup that use of button backlighting will drain the batteries much faster than the LCD. The R50 may not be a computer programmable remote control, but it’s hard these days to not expect computer-style features on any sort of remote control with a screen. For the most part the R50 delivers a level of function and control far beyond the majority of other standalone remotes; however the lack of key movement and button or background customization does leave one wishing for just a little bit more. With that said, as someone familiar with URC’s computer software I was surprised by how familiar programming the R50 felt. The designers have done a lot to make the R50’s internal program operate more like a PC application than a normal standalone remote, right down to the look of the icons used during setup to indicate the type of commands assigned to a key. There’s even some “wizard”-style behavior built-in. For instance, LCD-based buttons are shown in three colors – blue for active buttons, light grey for inactive (blank) buttons, and dark grey for hidden buttons. If you choose to learn a new command on an inactive grey button, the R50 conveniently asks if you’d like to first edit the button label - this doesn’t occur if a key is already active. Similarly, the first time a new device is selected for code learning the R50 goes through the steps of choosing a device type, picking an icon and naming the device. Although the R50’s on-screen setup is easier to use than even the once unrivaled menu-based system on the MX-500, it still manages to be a little confusing at times. It’s often unclear whether you should be using the directional pad, side LCD keys or lower LCD keys to make a menu selection, adjust an option or confirm something, as the different methods are used almost at random.